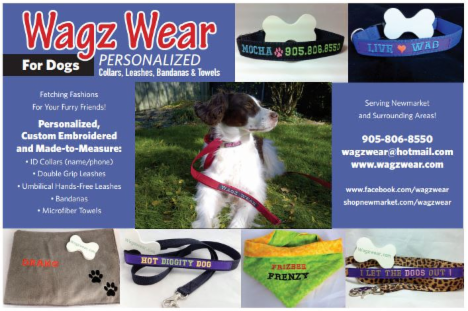 Wagz Wear - Personalized Embroidered ID Collars, Leashes, Bandanas, Towels, Car Seat Covers and more for your Furry Friends. Personalized ID Collars with Name & Cell# made to measure from 3/4" , 1" or 1.5" webbing Double Grip Control Leashes - 4ft. and 6ft. Umbilical/ Hands-Free Leashes Drypet Micrifiber Towels - Antibacterial, Hypoallergenic towels Custom Bandannas - Unique Embroidery Gel Cooling Collars - Stays cool for hours Car & Truck Seat Covers - "Zoom Zoom"
Wagz Wear specializes in custom embroidered, personalized pet accessories. All products are available with your pet's name and contact phone number embroidered in co-ordinating or contrasting stitching. More than just a fashionable accessory, if your pet is ever lost, your number can be read from a distance even if he has lost his tags or can't be caught. Wagz Wear collars and leashes are made of commercial grade nylon or polypropylene webbing that offers superior durability and water resistance. They are double stitched with heavy gauge thread and feature nickle plated D rings and heavy-duty plastic slides and side release buckles. Design Your Own!